GT Explains: What is the Difference Between LED, LCD and Plasma TVs and Which One to Buy? There was a time when buying a TV was easy. Your favorite brand just sold one kind of TV and all you had to do was walk into a store and empty your pockets. Those times only make for good anecdotes now. Today, buying a TV means choosing from a plethora of brands and, more importantly, choosing the kind of screen – LED, LCD or Plasma. While we all know what a normal CRT (Cathode Ray Tube) TV is (the bulky sets most of us grew up watching shows on), it’s the different flat screen displays that are confusing to pick from. When looked from a distance, LED, LCD and Plasma, all look the same. They are all flat, slim and available in a variety of sizes. But don’t get deceived by the look and pick on the basis of it. All of them have a set of advantages and disadvantages which you should know about before you get one. So today, we will first understand some basics of LCD, LED and Plasma TV in plain English, followed by a quick scorecard and checklist. Finally, we will try to answer the most important question: Which of them should you buy? Cool Tip: Don’t forget to read our definitive guide to connecting a computer to a TV. LCD (Liquid Crystal Display) is the most common display type these days when it comes to television. In an LCD TV, an LCD screen is at the front of a fluorescent backlight display. The television displays the image when the light from behind the screen falls on the LCD screen and a picture is built up with the combinations of the colors. The LCD TVs are relatively inexpensive and is the best bet for anyone looking for a flat screen television. One of the biggest disadvantages of the LCD display is that it cannot give a true black color experience. Not suitable for high frame rate gaming due to motion delays and higher latency. Jargon buster: In the article we have used one term over and over again while comparing the quality of TVs, and that’s True Black. True Black is the ability of a TV to give a completely black background through which the black colour (say a dark room) should look completely pitch black.However as TVs work on the principle of backlight falling on a screen, it’s very difficult to give out a true black effect. Either the front screen has to go completely black or the part of the backlight that falls on it should be turned off for the particular area so that a true black colour is produced. LED (Light Emitting Diodes) TVs are basically LCDs only. The difference is that the lamp behind the screen that was used to illuminate the fluorescent display in LCD is replaced by small LEDs. The working of the TV remains the same, but due to the use of LEDs the screen is much slimmer in size, power efficient and can yield a true black effect to a much greater extent. So let’s take a look at some of its advantages and disadvantages. LED TVs are incredibly slim when compared to the other kinds and come in variety of sizes. Due to the use of smaller LEDs to illuminate the display they consume less power. They have high response time and thus one can enjoy high frame console gaming without any motion delay and lags. Provide a richer, true black experience experience than the LCD TVs. LED television has a wider viewing angle around 175 degrees, which gives a better picture quality even when you are viewing it from the corners. They are expensive when compared to LCDs and Plasma TVs. 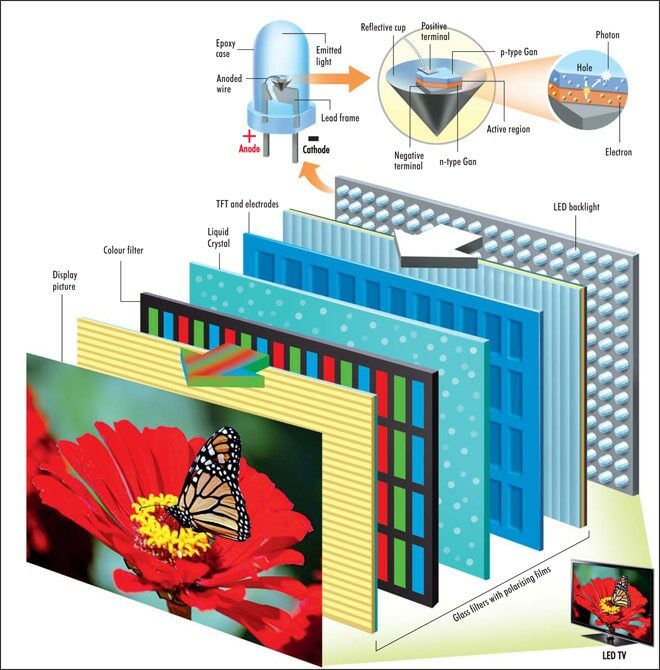 Plasma TVs are basically an array of light emitting gas cells sandwiched between two glass sheets. The fact that they do not rely on an external light source to power the display, they can give amazing true black effect. However, a glass panel is a mandate for a plasma TV and that’s the reason they are fairly bulky and give high glare when viewed in daylight. Each cell emitting light acts as an individual fluorescent tube making the TV less power efficient, but the images are crisper and more natural when compared to an LCD TV. Amazing picture quality and screen refresh rate. Ideal for gaming. Bulky and less energy efficient. The screen glares when used in daylight. Let’s have a quick look at the score card of all the three TVs based on some of the parameters. So now the real question is, which one of the above you should go for. Ideally speaking, if budget is not a criteria, LED TVs should be your best bet. They offer amazing picture quality even at wide viewing angles and is ideal for a living room. You can choose from various sizes too. If you are on a limited budget then LCD or Plasma are the remaining choices. For a standard well-lit living room, I would suggest an LCD TV. Plasma TVs have glass finish and thus they glare when used in light. If you are considering making a home theater where you can control the ambient light and make it dark, you could go for Plasma TV. The quality of picture is amazing but you need to keep in mind that all that comes for an added cost in the form of energy consumption. If an LED TV consumes ‘x’ units of power, ideally an LCD and Plasma TV of same dimension will consume ‘2x’ and ‘3x’ units of power respectively. Hopefully now you are more clear on the differences and only need to zero in on the brand. That’s something we’ll leave up to you (check places like reviews on Amazon and other shopping sites). Do tell us about your TV buying experience.